Yes! I know, I know…you must be rolling your eyes right about now. Tucson? Really? My answer is absolutely! I have to say, I would have been sharing your same reaction if someone had shared this thought with me. But give me a chance to defend our southern desert. I recently vacationed here with my family for a weekend away from home. We were looking forward to getting out of town and really didn’t care much where we were going. We are like everyone these days and needed our vacation spot to meet some specific criteria…namely, pricetag and close proximity of activities. Tucson delivered and then some! We stayed at the Tucson Omni National Resort where they are currently running an amazing summer deal where they match dollar for dollar what you spend on your room in resort dollars. So basically, whatever you pay on your room, you get back in cash you can spend at the resort! We golfed, dined, and some of our group even visited their spa…all for the price of the room! Now, I know what your saying…the food must’ve been nasty or the accommodations had to be poor. But I will tell you now that the room we stayed in was probably one of the nicest, largest and most well-equiped rooms we have ever stayed in. We had a dining area, sitting room, bedroom with two queen size beds, and a bathroom as large as the bedroom. The food was amazing whether we were eating in the formal dining restaurant, eating room service on our couch or munching on some great lunch dishes at the little cafe overlooking the golf course. The pool area was clean and large with a sand volleyball court and two full size tennis courts. They even offered lunch barbequed poolside along with drinks for guests playing in this area. The golf course was well-manicured and a lot of fun for experienced golfers as well as those of us who don’t play quite as often. It was challenging without being frustratingly difficult. The weather was amazing…warm in the mornings but by afternoon, Tucson’s legendary monsoon storms settled in and dropped the temperature 10 degrees while entertaining us with some spectacular lighting! Who needs fireworks? But Tucson delivered that as well over the fourth of July weekend. We visited the Kartchner Caverns which was a delight for my husband and I as well as my little ones. Amazing cave formations coupled with a family-friendly guide made the 45 minute tour a great experience for us all. Word to the wise, Kartchner Caverns sports an 80 degree temperature with about 98% humidity so don’t plan to go anywhere you have to look nice for afterwards! 😉 We were a little disappointed we couldn’t see the “Great Room” because this area closes down this tim eof year while the bats that make this cave their home are taking care of their babies. But maybe on our next trip. 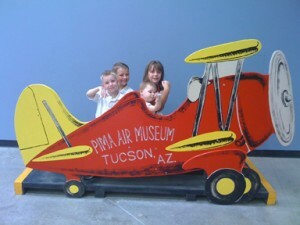 Pima County Air Musuem had some great hands on activities for the kids as well as some fun historical trivia for the adults! We also visited Pima County Air Museum. This had a wonderful array of history. I was impressed as I read about the different types of planes how many historical air events took place in Arizona. The kids had a wonderful time playing in the kid-friendly hanger where kids can be hands on with various types of planes, simulators and even toddler friendly equipment. We probably spent at least two hours here and didn’t even see the entire museum. There is a tram that will carry you throughout the outdoor exhibits but we declined this trip because it is not air conditioned and we didn’t like the idea of baking in the sun for 30 minutes. It gives us something to try next trip! 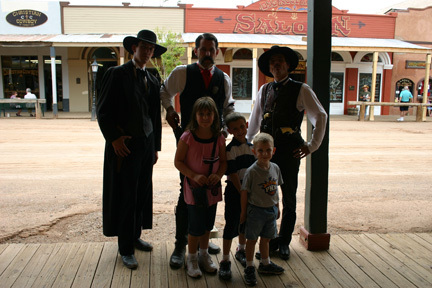 We took the short drive to Tombstone one day as well and had a wonderful time reliving the OK Corral with Wyatt Earp and his brothers. We even got some spooky fun visiting the real life haunted saloon, the Birdcage (I ended up with a few photos here that smack of ghost action!). This museum also has some amazing history. Did you know where the term “Aces and Eights = Dead Man’s Hand” came from? Wild Bill was shot in the back while playing poker…he died clutching his hand of aces and eights. The Birdcage is full of incredible history and worth taking some time to walk around and read the plaques. I read about a Children’s Museum here as well but we didn’t have time to visit this trip. Hopefully we can make it next trip because there will certainly be a “next trip”! I know most would roll their eyes at vacationing in Tucson, but I’m here to tell you…it’s a wonderful spot for a family on a budget and with a little forethought, you can find some wonderful “things to do” here!